NameCheap has been one of the leading Internet companies behind the fight for Net Neutrality. NameCheap has been advocating for Net Neutrality in a variety of ways on its website as well as on its NetNeutrality.com portal. 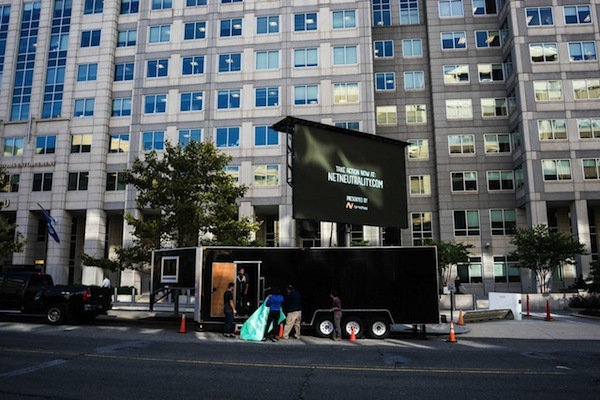 This afternoon, I saw a Facebook post from NameCheap CEO Rick Kirkendall with a photo of a video billboard advocating for Net Neutrality that has been set up right outside of FCC headquarters in Washington, DC. I learned that NameCheap has teamed up on this billboard protest with the non-profit Fight for the Future organization, which organized the Internet Slowdown campaign last week. Another interesting aspect of this is that anyone and everyone is invited to participate in this fight for Net Neutrality, even if they aren’t located in Washington, DC. On the page announcing the protest, Fight for the Future set up a Google Doc submission form for people to submit a link to their own videos about Net Neutrality, and the video will be broadcast on the billboard. In addition to the billboard, Fight for the Future is organizing a protest in front of the FCC building tomorrow, September 16 from 11:45am – 1pm. Full details about the protest can be found here. In addition to funding the billboard rental and other expenses related to this protest, NameCheap has also pledged to donate $0.25 to Fight for the Future and the EFF to fight for Net Neutrality. The company also stated, “If we hit 100,000 retweets, we will donate $100,000.” At the time of this post, the retweet count stands at 3,084. Kudos to NameCheap for advocating on behalf of Internet users who are seeking Net Neutrality. So, the stakes are high (to put it so mildly), and there the opposing entities are everyone from the littlest of the little guys and gals to the biggest and mightiest of the titans of American commerce. So sure, contact the FCC if you want, but remember they’ve already turned away from comments and petitions BEFORE this latest round of (pointless?) invited comments (again). As in – definitely don’t stop there at all or expect much from that point of contact based on what they’ve already done in response to the nation’s previous outcries. The simple fact that this is an issue shows how much corporations run, not just the U.S. and government, but even the “free” Internet. Oliver had a genius take on the situation.